Pleo has been upgraded, and a few are on the market. Feel like cuddling a robot? Pleo the original cuddly dinobot is back, and Innvo Labs CEO Derek Dotson has discussed some of the advanced features that will be found in the new model. Called the Pleo Reborn or Pleo RB, the latest version has some big advantages over its predecessors. 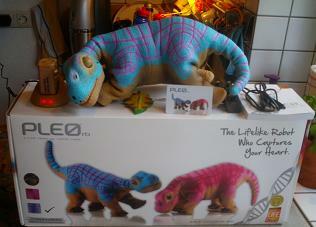 A longer battery life (up to 2 hours) and more durable skin means the Pleo RB will be able to spend more time playing. The dinosaur companion will also get sensor upgrades so it can feel a variety of new touches. It will even have a RFID detection system that lets it recognize and interact with a variety of different accessories – from food and medicine to ice and stones. A globe trotting fan of the Pleo dinosaur robot was able to snag an early copy of the new model at the Hong Kong Electronics Faire. He paid $500, but there’s no telling if that’s the price the rest will face as the toys are slowly rolled out in the next six months. You can see the baby dinobot move, play, and moan in the two videos below. Pleo RB isn’t the most amazing machine around, but I think it’s a good sign of how robots may become the pets of the future. Part of what makes the Pleo RB so intriguing as a playmate is that Innvo Labs has gone to great lengths to make it more of a unique character. Dotson explains that each Pleo RB will be ‘seeded’ with a different personality at birth. Some will be moodier, some quicker to become happy. How you raise your robot will still affect it, but there will be built-in traits as well. Just like real pets. Along with their varied personalities, the new versions will also come in several colors with a range of hues. Eye colors will vary so that each pet will look slightly different. Pleo RB will also have a voice recognition capability, allowing for more tricks and personalized interaction. Using a RFID card, you can give your Pleo RB its own name in a special ceremony when it reaches robot puberty (I’m not joking). Say its name and it recognizes you. Use a different RFID accessory (shaped like a stone) and you can teach the robot to perform various tricks at your command. Innvo Labs wants you to know that this will be your Pleo, no one else will have one quite like it. If that wasn’t enough to endear you to your robot pet, the Pleo RB will also be more needy. It will grow sick if you don’t feed it with a RFID leaf, and it can fall and hurt itself. RFID medicine will help it recover from its wounds and stop it from limping (yes, it limps and howls in pain if you touch its injury). An internal clock you can set to match your daily schedule and temperature sensors will further tie the Pleo RB to your environment. The robot lives where you live, is awake when you’re awake, and needs you to interact with it. That’s pretty amazing. And it speaks to something strange for robot pets of the future. I always thought that one of the advantages of robotic pets would be that they don’t really need you. They can’t die. Yet Innvo Labs seems to think that the more a robot needs you, the more you’ll want it. We’ve already seen how other robotic toys make demands on your time. Bots with desires may be the next big trend in virtual pets. Who knows what it will mean when we finally get around to creating virtual humans and robot lovers. Hmm…I’m fine with robots having character…as long as they have an off switch as well.